Danny O’Brien will retrace the successful spring plan with Prompt Return, who ramps up his Blue Diamond quest next Saturday. O’Brien plans to run Prompt Return, the impressive Maribyrnong Plate winner, in the $150,000 Group 3 Chairman’s Stakes (1000m) at Sportingbet Park. He said the three-week break between the Chairman’s Stakes and the $1 million Blue Diamond (1200m) at Caulfield on February 28 was identical to the timespan leading into Prompt Return's Maribyrnong Plate win. Prompt Return, a son of Beneteau, debuted with a win at Bendigo then three weeks later ran away with the Group 3 Maribynrong Plate at Flemington. O'Brien spelled Prompt Return after he ran second behind Carriages in the Magic Millions Clockwise Classic at Sportsbet Ballarat on November 22. “We’re just doing the same thing with him that we did in the spring,” O’Brien said. The colt has had the benefit of two jumpouts at Flemington last month. James Winks, who’ll again ride Prompt Return, said the colt’s first jumpout was low-key, but he did more at Flemington last Friday. “I opened him up a bit more last Friday and he ran really good time,” Winks said. Stablemate Ragazzo Del Corsa, winner at Flemington on January 10, will run in the Blue Diamond Prelude (1100m) at Caulfield on February 14. 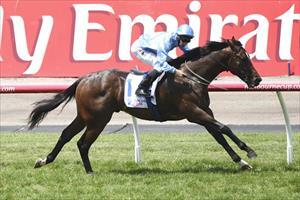 Sportsbet.com.au rates Prompt Return a $15 chance in the Blue Diamond with Ragazzo Del Corsa at $21. Its market has Secret Agenda and Fontiton as $4.60 equal favourites.